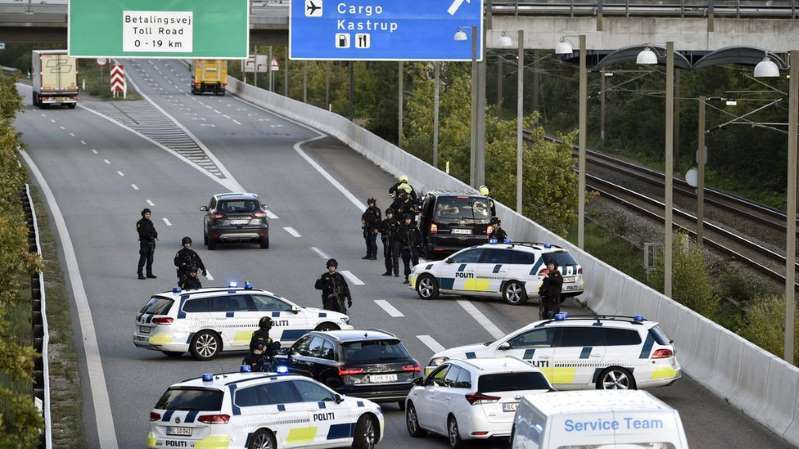 Danish police have questioned and released two suspects travelling in a Swedish car that was the subject of a huge manhunt on Friday. The pair were detained after they were seen acting in a way that suggested an imminent attack, officers said. It comes amid a continuing probe into death threats, local media quoted police as saying. Authorities briefly closed off transport links to and from Denmark's largest island Zealand in their search. Chief Police Inspector Jorgen Bergen Skov told reporters that police had been responding to a "worst-case scenario". "The Volvo was located nearby, and its behaviour close to the people under threat... indicated that an attack was about to happen," he said. Police now say that the people in the Volvo are linked to criminal activity but are not connected to the specific death threats being investigated, Politiken newspaper reported. Two separate investigations were now under way as a result, Chief Inspector Skov said, adding that there was no threat to the general public. The black Volvo had been rented in the Swedish capital Stockholm and was subsequently reported stolen from the airport in Malmo, which lies in Sweden across the Oresund Strait from the Danish capital Copenhagen. Denmark's Justice Minister Soren Poulsen has thanked the police for the way they conducted Friday's search, Politiken reported.